The foot could not be saved, and they were forced to amputate. Fortunately, they had Robocop’s right foot aside for just such an emergency. I am now able to stomp slowly and awkwardly around crime infested slums, although as I’m completely unarmed, this is not an advantage. 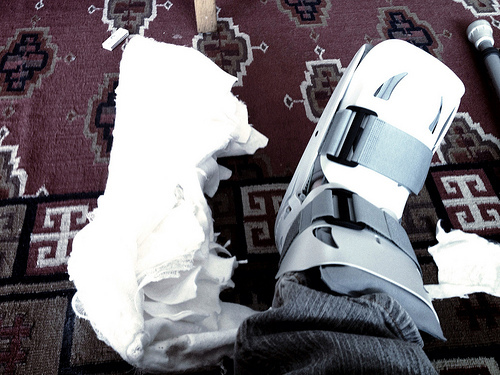 It’s a pneumatic boot/cast. There are airbags inside that I inflate when I put it on (to immobilise the ankle), and deflate when I take it off. I was sceptical, but it’s a big improvement. Yesterday, I was dragging myself around on two crutches, keeping all weight off the foot, and it was bloody exhausting. Now I can hobble about with one stick, and life is easier. If only it made an electronic whirrr thunk noise every time I took a step, my life would be complete. If it did that, I’d buy a matching one for my other foot, and wear them all the time.